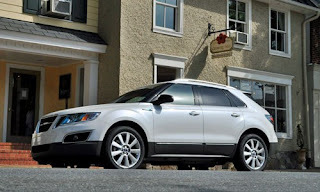 Life with Saab - Essential Saab news: Time to test drive the Saab 9-4X? Time to test drive the Saab 9-4X? The Saab 9-4Xs are arriving at the dealer. The car has been awarded the Top Safety Pick from the IIHS. And this weekend there was even reports that the first buyers got their brand new 9-4Xs! So what's better than checking out two more great 9-4X reviews? It's definitely a sportier package than, say, Lexus's RX, and it'll hold its own just fine against German rivals. Is the 9-4X a real Saab? Yes, there's no doubt that it feels like a Saab to drive. The driving position provides clear Saab vibes, with easy to read instruments and - of course, start button near the gear lever. Saab has a reputation of making good seats and the 9-4X is no exception. The driver sits comfortably and it's easy to find a good driving position. The steering is precise and the road handling secure.